OTTAWA — Ina Buckland is thankful this Thanksgiving for the service her late husband completed in the Navy and for the opportunity she has had for the last 60 years of honoring him by serving veterans. Buckland, 89, a resident at The Meadows of Ottawa, has served as an auxiliary member of the Kerner-Slusser American Legion Unit 63 for the past 60 years. She is currently one of the longest continuous members of the auxiliary in Ottawa. 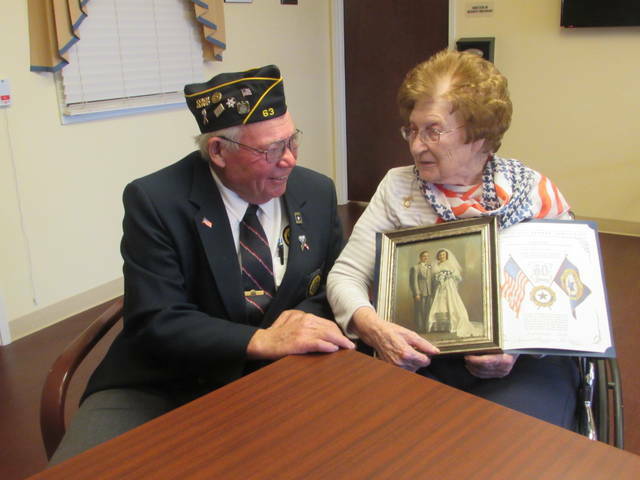 She joined the auxiliary in 1958 in honor of her husband, Bob, who was a member of the same American Legion. He died on Jan. 9, 2004 and they have four children, 8 grandchildren and five great-grandchildren. Bob served in World War II in the Navy aboard the USS Skagit. Her nephew, Don Riepenhoff, presented her with a pin, certificate and flag scarf from the legion recognizing her for her service. Riepenhoff has been a member of Legion Unit 63 for 48 years and served stateside during the Vietnam War. “It’s a good thing to honor her. My dad, Thomas, served in the Air Force and fixed radios during World War II,” Riepenhoff said. Buckland and her husband married in 1949 after he got out of the service, and they raised their four children in Ottawa. She still owns the same house they moved into on the east end of town. She served as a homemaker and cared for their children until she went to work at Sylvania in 1960 as a laborer. “Mom and Dad met by his brother and one of her friends who matched them,” said their daughter, Nancy Wannemacher. Buckland has fond memories of serving on the auxiliary over the years. “We had bake sales with money going to help veterans and we sent care packages to veterans overseas,” Buckland said. She also remembers making blankets for veterans in the VA hospital and marching in parades representing the American Legion Auxiliary. Other fond memories were sending Christmas cards to the troops. She said she is proud to be honored for her service to the Auxiliary. She described her husband as someone who was kind, generous and loving. Buckland’s daughter, who has served at the VFW in Ottoville since 1987 in honor of her father, said she is proud of her mom’s service. “I’m very proud of her because there are not that many people who have served for that long. Both my mom and dad have tried to help all service people wherever they could,” Wannemacher said.